Very shortly, “Dead Jed” is about to face something far more dangerous than any school bully. The book will be available on Netgalley (if it isn’t already), where it will face its first army of the judgmental. That’s the nature of the creation business. If you make something for the public – art, movies, baked pastries infused with dark chocolate – you are subject to criticism. Though really, it’s hard to think of anyone who would have problems with baked pastries infused with dark chocolate. I embrace our love of opinion. Purchases often are driven by reviews, from Amazon to Yelp. For a while I was a (semi) professional film critic, and a member of the Phoenix Film Critics Society. I know the value of knowledgeable criticism. And though I may have been the least knowledgeable member of the film critics society, I enjoyed sharing my opinion with readers. As a reporter with hundreds of stories under his belt, I’ve heard from plenty of angry people. Fortunately, it has served to thicken my skin. Over the decades I’ve received highly critical letters and emails in response to what I’ve written. Nearly all have had to do more with content than style, people arguing with whatever point of view may have been taken in the article. My favorite reader response, however, was sent just a few months ago. It was one sentence – “Do you actually get paid for writing such banal drivel and, if so, how do you sleep at night?” In responding, I employed an old trick used by several colleagues: “Thank you for taking the time to write. Due to the volume of emails I receive, I am unable to personally reply to each one, but I appreciate your comments and support.” The person has written me on occasion since then, the latest one expressing his hope that I never write about a subject that interests him, because as soon as he sees my byline, he moves on. Being reviewed as an author is going to be an interesting experience. Throughout my career I’ve written about other people, my stories based on their words and deeds. “Dead Jed,” however, is mine (with the help of very talented editors). My plot, my characters, my dialogue. If certain people hate it, that rests solely with me. I am somewhat comforted by the fact “Dead Jed” was good enough to convince an agent to pitch to a publisher who agreed to invest time and money and put it on shelves. I’ve received many positive comments through the process, so it’s not like I’m going into a critical vacuum with absolutely no idea what anyone thinks about it. (Yes, my beta reader loved it, as did her kids, but she also loved me so you really can’t count that opinion – and the book is dedicated to her, my only regret being she did not live long enough to see it published). I am hopeful “Dead Jed” will garner positive reviews. But I know it won’t please everybody, and expect to see some negative reviews. Either way, I’m proud of the book and hope the vast majority of readers will find much to like. And to those that find nothing of redeeming value, I appreciate you giving it a shot. That’s all I can ask. Years ago, in a time I was still considered to be young with potential, I covered the police beat for The Phoenix Gazette, working the morning shift for the (now dearly departed) afternoon daily. One day I dashed out a story about burglars who tossed out stolen items as they were chased by police. That afternoon I was surprised by two things – it was on the front page, and the story that appeared below my byline was not my story. There were some common words, but that was purely coincidental. What truly horrified me was that it was a much better story, playing the chase as if a scene from a Hollywood movie. Still, that was some ugly editing. The editor should have done me the courtesy of letting me know he was rewriting the entire thing, making sure to remove my name from the story. In my 35 years as a journalist, I’ve been lucky to have many extremely talented editors who collaborated with me to improve my stories. And I’ve had a few who took it upon themselves to make wholesale changes without so much as a heads-up (leaving me to answer for errors because they assumed facts not in evidence). But the most egregious editing is aggressive editing, when the editor inserts his or her voice in the story, believing the tone is an improvement. Most of the time, however, it’s not better, just different. Having thousands of stories under my (very old, unfashionable) belt, I’m a huge fan of editing. Wait, strike that. I am a huge fan of quality, collaborative editing, and fortunately that is what I’ve received more often than not. Not long after my agent and I signed with Month9Books to publish Dead Jed, I had a conference call with the soon-to-be editor, Courtney. Having no idea how other authors felt about their words (I never forgot mine appeared on cheap paper often used to potty-train pups or as filler in parcels), I made only one request of my new editor. If a rewrite is called for, please allow me the first stab (or two) at it. A few months later Courtney sent me a lengthy cover letter telling me all that was wrong with Dead Jed, attaching the manuscript with suggested changes. I skipped right over her first paragraph that said something along of the lines of “I really like this book” and got right to the, “That being said …” part. Due to a communications snafu, I had only two weeks to finish (four weeks fewer than planned). I added a chapter here, moved another one there. I strengthened a character, punched up some of the jokes, whittled down the (un)dead passages. It was a lot of work, way more than I expected. And Dead Jed is a much better book for it. Courtney’s changes were excellent, and she let me do all the heavy lifting. There was still much fine-tuning along the way, but I am indebted to Courtney and look forward to working with her on the second book (which is in her hands right now, and no matter how much I liked the manuscript, I know Courtney will give me much more work to do – at least that’s what I’m hoping). I found out in a letter from my doctor. It arrived late Saturday afternoon so I couldn’t call for the specifics. And it didn’t actually say I had cancer, but it might as well have. Five days before I joined the very morose crowd of folks waiting to have blood drawn. (Note to medical labs: Make sure the only TV in the waiting room is not tuned to The Disease Channel, where you learn how the slightest symptoms can indicate the onset of sometimes fatal infections, all of which can be treated by doctors in this fine medical complex). I was there for the routine blood test following my annual physical. After my two prior physicals, I had received a very nice letter from my physician with test results attached – last year he called my blood-work “superb” – and he had joked on prior visits that if anything serious turned up, his office would call. “But you don’t have to worry about that,” he said. If he could high-five my blood chemistry, he would. So I didn’t worry when his office left a message on my machine the day after my visit to the lab, asking me to call for my results. And I worried just a little bit when another message was left on Friday. I’ll just wait him out, I thought. He’ll send me my results and another compliment-filled letter praising my most essential bodily fluid. Sure enough the letter arrived, my name handwritten on the front. From the security mailbox to my front door, I was walking on sunshine. Until I noticed the thinness of the envelope. There should have been three sheets of paper, the complimentary letter and two pages of results. But this envelope contained one sheet at best. Maybe my doctor just decided to praise me, summing up the amazing results rather than boring me with the details. I ripped open the envelope and drew out the two-sentence letter. My earliest convenience? Was that “We’ve got bad news”-speak for “as soon as you possibly can”? Yes, I decided. The results had to contain something terrible. That’s when I just knew I had cancer. I’d known all about how the PSA test screens for antigens that can indicate the presence of prostate cancer. I also knew the test was controversial, that it had a fair amount of false positives and false negatives, that many doctors didn’t like to use it. I went to the online source – the National Cancer Institute. There it was in black and white and blue (hyperlinks). From diagnosis to testing to treatment to prognosis. The biopsy alone sounded like something out of the Spanish Inquisition, pushing a needle between two very private parts to snag a chunk of prostate. A few years ago, I watched the most important woman in my life die from the chemo she underwent for fourth-stage colon cancer. Here I was not even knowing for sure (yet deep down knowing for sure) I had cancer, and she bravely battled it for almost five months. I have no idea how she did it. I have no idea how anyone does it. After another sleepless night, I called the doctor’s office at 8 a.m. Monday, prepared for the worst. As I was on hold, my heart thumped while the rollercoaster teetered on the edge of the first drop, and I couldn’t see the track from here. She rattled off numbers. Blood sugar. HDL. LDL. Some other meaningless stuff. I listened carefully. More numbers, but I wasn’t listening anymore. I was incredibly happy, and incredibly disappointed in myself. I was such a wuss in the face of potentially bad news. To those who have had real confrontations with cancer, and faced it head-on, I salute your courage. You are all amazing bad-asses. I wrote “Dead Jed: Adventures of a Middle School Zombie” more than four years ago. In that time, it’s been read by dozens of people, first by an author friend of mine (who offered much-needed tough love when she told me the first chapter was, essentially, undead on arrival). Then by friends, relatives, agents, publishers, editors, more editors, and more editors. With publication just a few months away, there is still one person rather close to me who has not read one word of the book. No, let me clarify. He has refused to read it. Meanwhile, back to what I was saying – the person who has instituted his inalienable refusal-to-read rights happens to be my 18-year-old son Bryson. The very same Bryson to whom I read for hours and hours when he was a child. Sure, I knew Mr. Brown could moo without opening the book, yet Bryson was still tantalized by the tale after the 50th reading, Mt. Brown mooing the entire time, though he got a little hoarse. Me: The kid zombie book. The one I’ve been working on for, what, nine months. Bryson: How long is it? Me: I’m not sure. Maybe 50,000 words. Me: Sort of, I guess. You want to read it? Me: Seriously? My own son won’t read my book? Bryson: I’ll read it if it’s published. I was speechless as I walked out of his room. And four years later, he has stuck by those words, so he gets point for dedication. Bryson’s refusal surfaced in a recent conversation with my dad. “Bryson isn’t your audience,” he said. I have moved on. To a point. But I know what is going to happen Dec. 3 when “Dead Jed” hits shelves. I am going to toss him the book, telling him it’s time to keep his promise. Jaime Clark is one of the coolest people I’ve never met, and probably never will. You’ve probably never met him either but as soon as I tell you the secret to his coolness, you’ll probably want to have a beer with him..
Jaime is creator and webmaster of pleasedontbuymybookonamazon.com, one of the most self-explanatory website names – even better than bread.com where, despite the name, you cannot actually buy bread. See for yourself. We’ll wait … so it’s been pretty sunny here the past week, not that rain is a bad thing but it sure brightens the … ah, you’re back. What did I tell you? Yes, I clicked on “Grain Basket” too thinking it was the shopping cart. Nope. Jaime does not feel the same way. His book, “Vernon Downs,” will be available on his website in December, and then on Amazon in April. Clarke, who also happens to own an independent bookstore, said royalties from presales will go to the book’s small independent publisher, Roundabout Press. See how the coolness is seeping in? Jaime doesn’t like how Amazon (the Empire) dictates discount fees for all, from publishing’s Big 6 (Jedi) to small publishers (Wookies). He would love for you to buy his book, just not on Amazon. Due to the fact I want people to be able to find my book, even purchase it with every intention of reading it, I am firmly in the Empire’s tractor beam. At this point, two months before publication, my book is nowhere to be found on Amazon. Go ahead, look. Oh, now you trust me. Fine. When you plug “Dead Jed” into the search box, one of the first listings is “Jed the Dead” by Alan Dean Foster, a book Amazon does not even carry (its alternative sellers do, however). “Dead Jed’ is on the Barnes and Noble site. And at half.com. But Amazon and its billion customers remain Dead Jed-free. At some point “Dead Jed” will be listed, and I can only guess the majority of sales will come through Amazon. I’d like to think the middle-grade book would do just as well in independent bookstores, but they don’t have Amazon’s interstellar reach. I don’t care how people get the book as long as they get the book. I believe my small independent publisher – Month9Books – feels the same way. I’ll be rooting for Jaime and his novel approach, and will be happy to visit an independent bookstore to buy it. But if that store does not carry it, I hope he doesn’t mind if I buy the book it on Amazon. I am a Prime member, after all, and love the fast, free shipping. How many people does it take to form a club? One? If so, I would like to introduce the official Dead Jed Fan Club, better known at this point as Joshua. Joshua is uniquely qualified to be the Dead Jed Fan Club because in his room he has displayed a Dead Jed post card, signed by me. He also has admitted to family members he wants to read the book when it comes out December 3. He has thus met all the requirements of the Dead Jed Fan Club – he likes reading, he likes zombies, and he did not stuff my autograph in his underwear drawer. There are those who might argue that one person cannot make a club, and to them I say – whatever. You can make that rule when your character has a fan club. You are probably wondering just how a 13-year-old boy became such a fan-club prodigy. Imagine a male infant born on the floor of Comicon 13 years ago, his mother sure she had two more weeks before he would arrive, thus spending a glorious San Diego weekend cosplaying as Ethereaus, Goddess of Eternity, her powers as plain as the silver colander on her head. Now imagine that baby taking it all in, the superheroes and space warriors and, of course zombies. Could his destiny have been any different? Little did I know that as soon as I said, “Sure,” the foundation of the Dead Jed Fan Club had been laid. Yeah, I haven’t really thought that one out. Besides, it was getting a little too weird. I am often asked, “Where did you get the idea for middle-school zombie,” and by “often” I mean that one time I insisted on telling a colleague who made the mistake of feigning interest in my life outside the newsroom. I don’t remember the specific day the idea arrived, only that it was hot, narrowing it down to one of the eight months in Phoenix that qualify as uncomfortably scorching (that would be March-October, for the uninitiated). However, I do vaguely recollect this particular day being at the end of August, when I was likely in the midst of one of my four daily showers. While squirting body wash on a loofa, I thought about how difficult it would be for a zombie to fit into middle school. Yes, just like that. Everyone knows middle-schoolers are hard on everyone. Not playing sports makes you an outsider. A zit on your forehead makes you an outsider. Studying hard for good grades makes you an outsider. Ironically, being outside does not make you an outsider, as long as you are with the kids copping a smoke under the oak tree in the far corner of the playground. Imagine what a middle-school zombie would go through. And that is precisely what I started to do. But not a flesh-eating, lurching, brain-dead zombie popularized in Hollywood. A nice, decent zombie who enters politely through doors rather than crashing through windows, and prefers chicken nuggets dipped in honey sauce over fresh human intestines when it came to after-school snacking. I dried off, dressed and started writing. No, that’s not quite right. First I Googled “zombie middle school novel” to make sure no one else had written something like it, since it seemed like one of those ideas that was too obvious to have gone undiscovered. Like that really good but really secret Thai restaurant in a strip mall someone told you about, and when you go the only thing you discover is a 45-minute wait for a table. Dozens of zombie tomes popped up in my search, but nothing about a relatively normal teen zombie going to school. And certainly none with humor at the core. Within four hours the first chapter was written (it was not very good, but it was a start). For the next six months or so, I worked weekends and a few nights, all the while hoping there wasn’t a similar novel in someone’s pipeline. Now as publication approaches, I can honestly say that of all the zombie books about middle-schoolers, “Dead Jed” is the funniest one written by me. Until this year, I’d never attended a book convention. No reason to. As an avid reader, I got my fix at bookstores and Amazon. So when my publisher invited me to May’s BookExpo America in New York, I booked a flight so quickly that it may have occurred the day before I even knew there was a BookExpo America. The best moment was checking in and being handed an author badge. That was before I went onto the massive floor filled with people, many wearing the same kind of badge I was. I realized everyone in America has written a book. How is anyone ever going to find my quaint middle-grade tome about a zombie just trying to fit in? I spent the first day attending panels populated by amazingly talented authors who were asking the same question — how is anyone going to find my (fantasy, romance, young adult, paranormal, Hemingwayesque) novel when everyone in (America, the Western Hemisphere, the world) has written a book? When you are rubbing elbows and bindings with so many writers in one confined space, you feel there are not enough readers to go around. At the end of the first day, my thoughts drifted to sales. My dad said he’d buy a copy of “Dead Jed.” And some of my colleagues. A neighbor mentioned she might want one. A couple of friends said to remind them when the book was published, so that was promising. But since returning and getting back to real life, I’ve reminded myself of why I wrote Dead Jed. Certainly not for the money. Fame? Not unless I changed my last name to Kardashian. A few days ago I looked up an email I’d sent to a friend back in 2010, when I was looking for an agent. This is what I wrote about the sense of accomplishment I felt at finishing “Dead Jed:” “I envision a day when I am visiting a classroom, talking about writing, and as the bell rings I hold up a copy of ‘Dead Jed’ and say, ‘Check this out if you have the time.’ The kids all leave, many of them bored, but one stops and asks to see the book. He flips through it. He stops, reads a paragraph, laughs. And says, ‘Cool. I hope to be a writer someday.’ He gives me back the book and heads toward the door. Just before he leaves, I say, ‘Hey kid.’ He turns. I toss him the book and say, ‘Send me yours when it’s published.’ A total Mean Joe Greene moment.” Yes, my friend is old enough to know that famous Coke commercial. The real payoff is connecting with readers. It’s fun to think of someone seven or eight years from now, moving out of the house, taking their dog-eared “Dead Jed” book with them because they loved it growing up. I hope to hear from as many potential readers as possible. I’d be happy to come to school, a library, a bookstore. If it’s too far to drive, I’ll get on Skype for a video chat. Doesn’t matter if it’s one reader or 100. Leave a comment. Send an email. Hit me on Twitter. Buy the book. Don’t buy the book. Either way, I am always happy to talk about writing. And if Dead Jed gets one boy or girl interesting in reading, or in writing, it was worth the work so many people put into it. Welcome to my official author blog, which is not to be confused with my unofficial blog that does exist and is difficult to find since I haven’t done anything with it in years. It was started in those innocent times when everyone thought all they had to do was write a blog and the world would come. The world did not. Stupid world. The goal is to try harder now, sharing thoughts and insights relevant to those who may want to know a little bit about the guy who wrote about an undead seventh grader. Like, for example, why would a guy write about an undead seventh grader? Hasn’t it been done hundreds of times before? 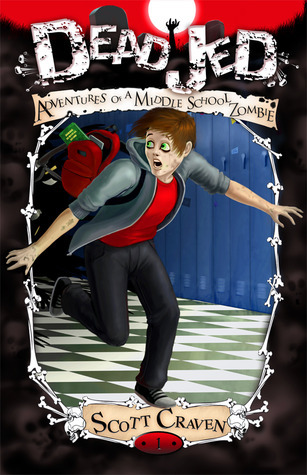 And just how far has “Dead Jed: Adventures of a Middle School Zombie” lowered the bar for getting a book published? The answers are, in order: I thought it could be fun, surprisingly no, and why would you ask that without even reading the book? Since “Dead Jed” won’t be out until Dec. 3, and you likely have very little interest in the author of a book you can’t buy, I’m going to keep this introduction short and sweet. Well. at least short. I hope you’ll come back every now and then, get to know me a bit, as I look forward to getting to know you through comments and other forms of digital interactivity (including Twitter, where I’m @Scott_Craven2, since other Scott Cravens took my first few choices — stupid Scott Cravens). Again, thanks for dropping by. Hope to see you soon. Jed would give an arm and a leg to fit into middle school, and he actually can since he happens to be undead. But his gray pallor and detachable limbs draw the attention of the school bully who thinks zombies should rest in pieces. Edited by Courtney Koschel. Cover by Victoria Faye and Zach Schoenbaum. ISBN: 978-0-9883409-0-9 (paperback), 978-0-939765-56-7 (ebook). Coming in December: "Dead Jed 2: Dawn of the Jed"
Giveaway ends November 07, 2014. © 2019 Scott Craven. All rights reserved.